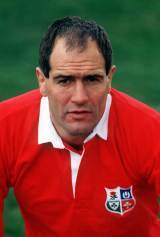 Paul Ackford was a lock for both England and the British and Irish Lions, touring with the Lions in Australia in 1989. Ackford was a police officer during his playing days and came to the attention of the England selectors after joining Harlequins and the Police in 1988. He won his first England cap against Australia in November 1988, aged 30. He was soon on the plane to Australia with the Lions, where he played in all three Tests as the Lions took the series. He was infamously knocked out by young Argentina prop Federico Mendez at Twickenham in 1990. Ackford was part of the England side that won the Grand Slam in 1991, and retired following the Rugby World Cup later that year, becoming a journalist.